The principle o photography was known as early as the 16th centruy. In 1802, Thomas Wedgewood wrote a paper on "an account of a method of copying paintings upon glass, and making profiles by the agency of light upon nitrate of silver. In 1824 Daguerre commenced his experiments, and in 1839, Mr. Talbot published a method of producing prints from a negative. 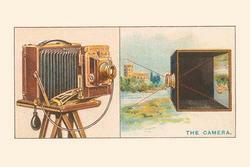 Dry plates were introduced in 1874, and in 1893 photographs in natural colors were produced by Lumiere.